It might be best to only display this message when one of the template modes changes. On first activating the plugin, there probably won't be any validation errors (see #1399 (comment)). So the 'or Review errors' part of the notice might not apply. This could query for errors, and conditionally show that text. I don't think this should be the case necessarily. If it only shows when changing the template mode, then in reality it won't show very much. This surfaces the discussion we had awhile ago about showing the validation status alongside each of the supportable templates. 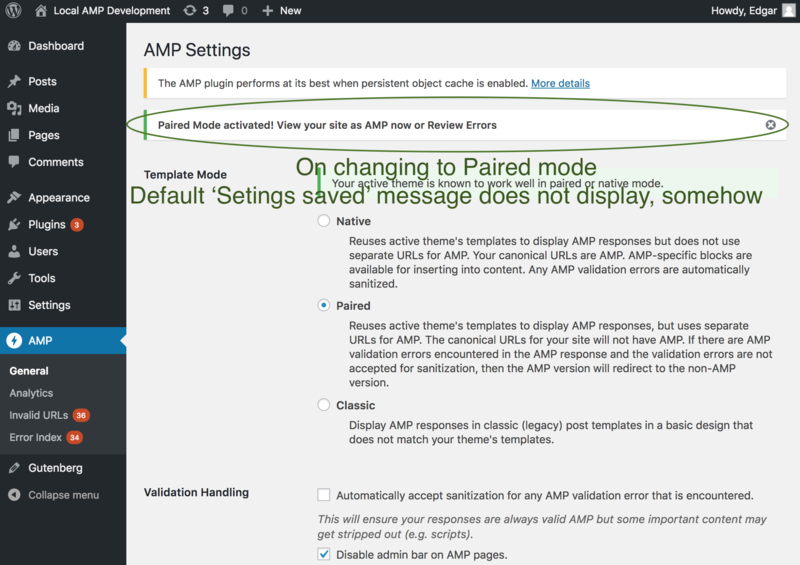 When visiting the AMP settings screen, I think we need to make sure that there are some invalid URLs captured for us to show. This could be done server-side when switching the mode, or when visiting this settings screen there could be Ajax requests triggered to validate the latest URL of each supported template type. 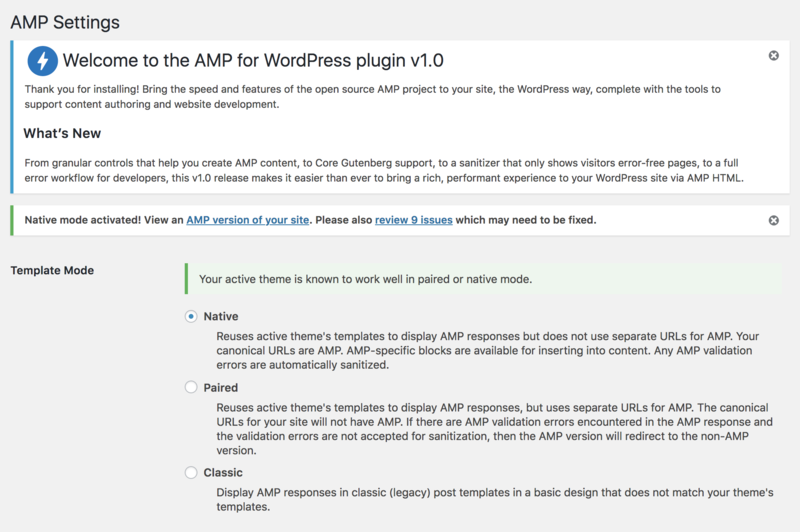 That may be overkill to start with, so perhaps the best thing would be upon switching the mode to obtain the first post type that is supported by AMP, and obtain the first published post of that type that has AMP enabled, and then re-validate that URL. When the page then reloads there will be validation results available to show. $wp_settings_errors[ $key ]['message'] = $message; // WPCS: Global override OK.
// Ensure that this notice does not display again. We can remove the user meta flag. The notice should be shown each time the user changes the mode. Good point. 3a75250 removes the user meta as a condition of displaying this message. If you call add_settings_error() inside the option sanitizer callback, where we can detect the mode change, then this will get stored in a transient to then automatically be displayed with the admin_notices when the page reloads. What this won't do is hide the default settings updated notice. Note that add_settings_error() has a $type parameter which can be "updated", so not an error at all. Great idea. cc2e62f uses add_settings_error() in the sanitize_callback. Though I'm not sure why, it seems like the default message doesn't display when this is added. add this in the sanitize_callback for the option. 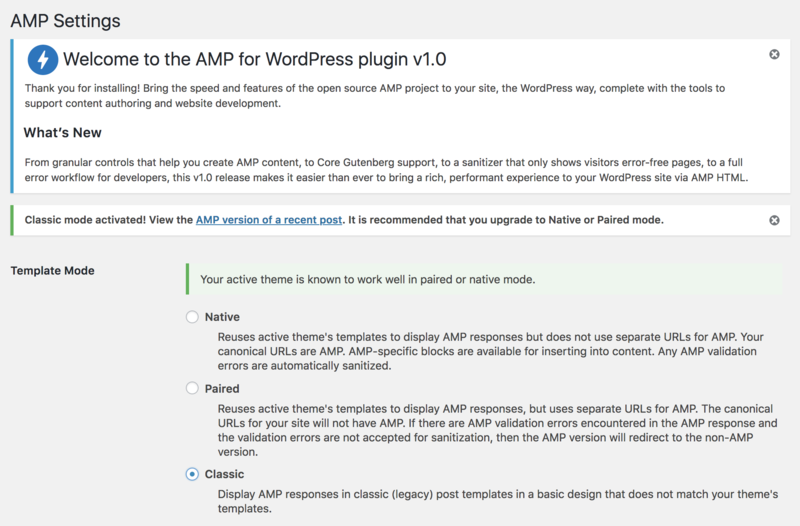 ...perhaps the best thing would be upon switching the mode to obtain the first post type that is supported by AMP, and obtain the first published post of that type that has AMP enabled, and then re-validate that URL. When the page then reloads there will be validation results available to show. Good idea, it would make sense to validate a URL on switching template modes. 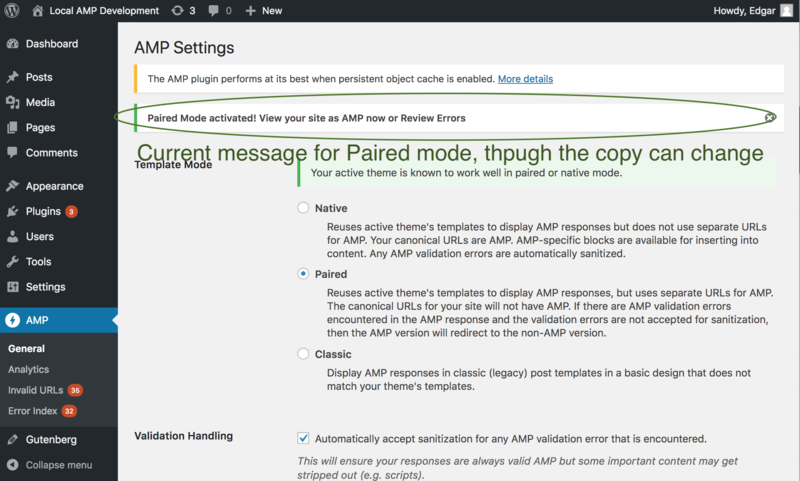 Do you think this could reuse AMP_Validation_Manager:: validate_after_plugin_activation() to do this? If so, maybe we could rename it. If by chance there's no error after validating that URL, should this still have the 'or Review Errors' text, with a link to an empty Invalid URLs page? Or should this possibly query for amp_invalid_url, and only show the message with 'or Review Errors' if an error exists? @kienstra using validate_after_plugin_activation isn't quite right because it sets that transient. Otherwise, it's right. Maybe most of the guts of that method should be moved to another method, like validate_latest_post() which would store the results and and return the ID for the amp_invalid_url post. In reality, the $validation_errors should not be stored in the transient. Only the ID should be stored. 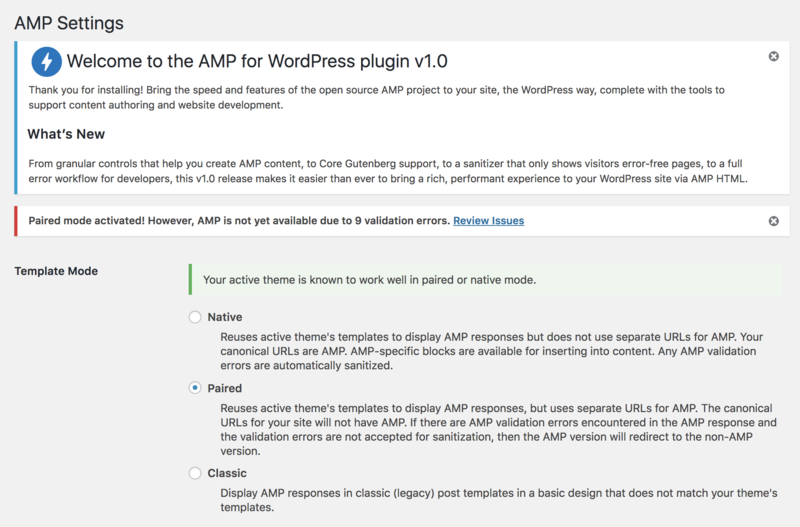 The plugin can then read the ID and then fetch the validation errors from AMP_Invalid_URL_Post_Type::get_invalid_url_validation_errors() instead of from the transient. And yes, if there are no unaccepted validation errors on the URL then that “Review Errors” link should be removed. Sorry for the delay in applying your suggestions. If it's alright, I"m planning on applying them today. Here's where I'm going with the messages. They vary based on the mode switched to, and there are links to view either the validated URL on the site, and/or to view the validation errors for that URL.